The hotel is located in Crêches-sur-Saône, at the junction of highways A6/A406 toward the A40, 5 minutes from Mâcon Loché train station, 4.3 miles (7 km) from Mâcon and 3 minutes from the Mâcon Chaintré equestrian center. The hotel has 80 rooms, including 7 family rooms, all air-conditioned and equipped with the new Sweet Bed by ibis bedding. It has 2 meeting rooms, a restaurant, bar, round-the-clock snack service, and free WIFI. The hotel has a free, enclosed car park with CCTV. TGV station 10 min from the hotel. Discover the wine route, the drive to the Romanesque churches and the Lamartine valley; stroll along the banks of the river Saône and around old Mâcon. The ibis Mâcon Sud hotel is located in Crèches-sur-Saone, 4.3 mi. from Le Spot exhibition center, 5 mi. from the Hameau Duboeuf wine theme park and the Beaujolais and Macon vineyards, 4.3 mi. from Touroparc Zoo, and 15 min from Solutré and Cluny. Featuring the new "Sweet Bed by ibis" bedding, this new ibis room offers the ultimate in comfort, with a double bed, desk, Internet, wood floor, LCD flat-screen TV with all the major channels and a bathroom. 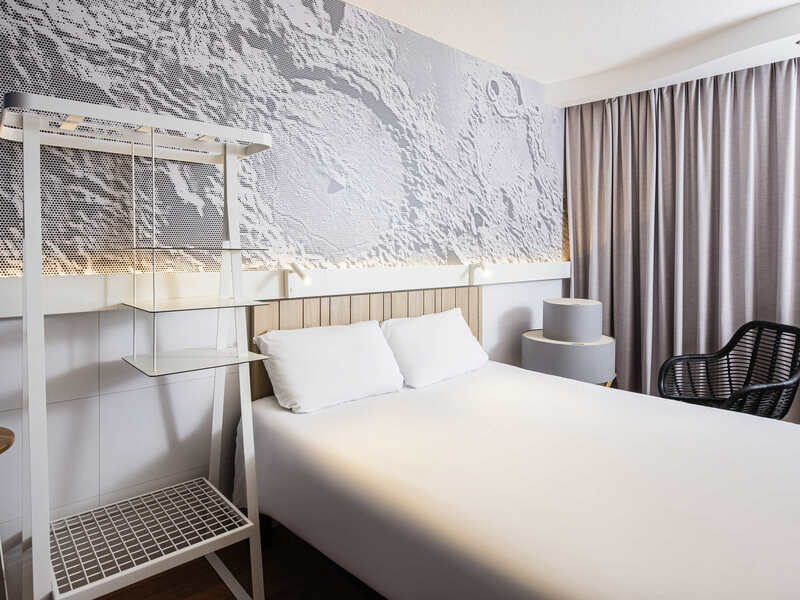 The new ibis room features the new Sweet Bed by ibis bedding and offers the ultimate in comfort: a double bed, a single bed, desk, Internet, parquet flooring, LCD flat-screen television with all the main channels and a bathroom. The new ibis room features the new Sweet Bed by ibis bedding and offers the ultimate in comfort, with twin beds, desk, Internet, parquet floor, LCD flat-screen TV with all the main channels and a bathroom. Featuring the new Sweet Bed by ibis bedding, this new ibis room offers the ultimate in comfort, with three single beds, desk, Internet, wood floor, LCD flat-screen TV with all the main channels and a bathroom. The ibis Family Room features the new Sweet Bed by ibis bedding and offers the ultimate in comfort, with a double bed and two single sofa beds, desk, Internet, wood floor, LCD flat-screen TV with all the main channels and a bathroom. We normally stay at the Ibis Budget but there was so little price difference at this time that we 'upgraded' It was a little difficult to get to as we were driving south so signage could be improved. The stay was good though. Very nice room and very nice staff. Good breakfast in the morning . No hot option for breakfast (apart from boiled eggs) but everyrhing you wanted for a cold buffet. If you require, Carrefours is a short walk away. I just stayed in Macon for one night with my family (2 adults - 2 kids). Room was simple bud large and the breakfast was very good. We enjoyed our stay. The hotel is really good, very clean and modern. There was access to an outside space which was really pleasant although it was too cold to use it. The hotel was clean, welcoming and although the bedroom was small, it was adequate, clean and comfortable. The dinner was also good value and the food good, with friendly service. The breakfast was also very good with wide ranging options. Very easy and well proportioned rooms for families. Used to break a journey with an overnight stop. Decent hotel, quiet location, other facilities nearby. Better than the Ibis budget rooms. All was good and as expected from a &quot;budget&quot; brand like Ibis - only disappointment was the evening meal (around 21.00), I ordered steak, it was aweful, Med/rare, but very red in the middle but not juicy at all - very dry and smelled a bit too (probably in the fridge all day!!! ), like trying to chew my shoes it was so tough, left most of it, pity as there is a Grill Restaurant next to the hotel - I wish I had gone there. comfortable room in quiet surroundings, convenient location. Nicely designed hotel close to the autoroute. Good bistro restaurant and friendly staff. Friendly service and wonderful food & wine. Thank you. Typical Ibis hotel in commercial area. Welcome reasonable though slow, restaurant provided good food with good service (one inexperienced waitress made a mistake in the order, but this was quickly rectified by the lovely waitress in charge and by the kitchen), and the room was a typical Ibis room. Two low-points: if you drive in by the rear entrance (the first entrance we came to) beware the concrete ramp at the gateway which scraped the bottom of my car, and a dispute over my Ibis Business card reduction on the meal which failed to show up on the restaurant bill despite booking a Business card room and receiving a welcome drink - the receptionist in the morning refused to take it off, saying she would have to consult with the manageress at lunch time. I have still not received the rebate three days later.